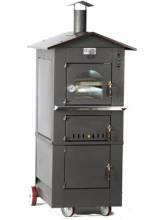 Step it up a notch, and save on electric bills, by making your pizza in a wood burning oven! Add it as an extra incentive to you restaurant, catering business, or even your house! Make it a main attraction, by cooking in view of your customers! Take a cue from sushi chefs, and make the cooking of the pizza a part of the fun! Don’t limit your wood burning oven to only pizza! Think outside the box, by broadening the types of food your going to cook with it! An Italian made wood burning oven makes everything taste better!